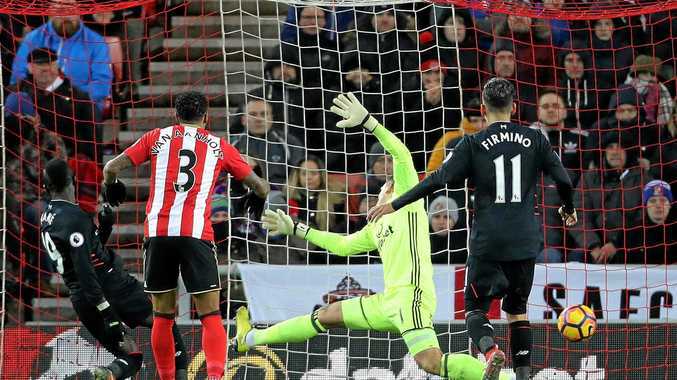 FOOTBALL: Liverpool boss Jurgen Klopp has been left to rue two dropped points as Sunderland twice fought back from a goal down to draw 2-2 in the English Premier League. Two penalties from Jermain Defoe at the Stadium of Light cost the Reds the chance to move to three points behind leader Chelsea. Daniel Sturridge opened the scoring before Defoe converted from the spot after a controversial penalty decision. Sadio Mane scored midway through the second half but then handled a free-kick to give Defoe the chance to level again, which he converted. Klopp questioned whether the first penalty should have been given and also said the free-kick that led to the second penalty should not have been given. "I must be honest, it doesn't feel good,” he told the BBC. "It's not because of the point. It's because of two penalties in the game. Manchester City had Fernandinho sent off but still defeated Burnley 2-1 to move up to third. Gael Clichy and substitute Sergio Aguero scored second-half goals to seal the points at Etihad Stadium. Manchester United won for the sixth straight league game with a 2-0 victory at West Ham. Zlatan Ibrahimovic struck his 13th league goal of the season with Juan Mata adding a second after the Hammers had Sofiane Feghouli unfairly sent off. United moved level on 39 points with fifth-placed Tottenham Hotspur, which plays Chelsea on Thursday morning (AEST). Hull City's relegation woes continued following a 3-1 defeat at West Bromwich Albion, while Middlesbrough and Leicester City played out a miserable 0-0 draw at the Riverside Stadium. Everton manager Ronald Koeman enjoyed a 3-0 victory over his former club Southampton thanks to late goals from Enner Valencia, Leighton Baines and Romelu Lukaku.